Oh how I do love AUTUMN!! Though of course the spring and summer months are wonderful for just “walking out the house and being indoors” and the autumn, does indeed start to get gloomier and darker, how can you not love all the beautiful beautiful colours that surround us. Nature has a wonderful way of easing us into the gloomy Winter months. 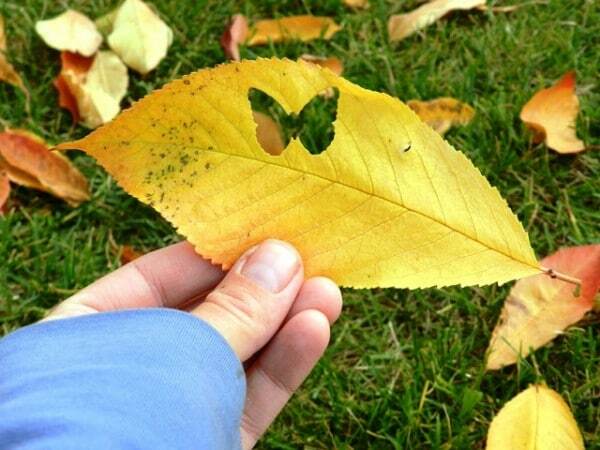 And we love to delight at the fantastic autumn leaves and autumn colours out there. 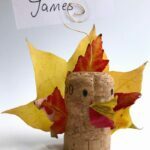 We also enjoy collecting other autumn finds such as pine cones, conkers and acorns and getting crafty with all of them. 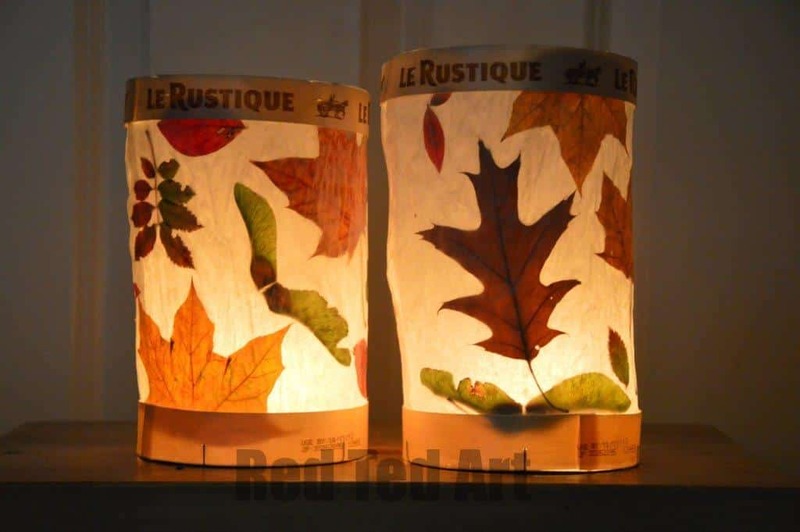 We do particularly love a great set of Leaf Crafts! 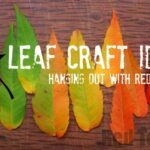 Today it is all about autumn leaves and autumn leaf crafts! 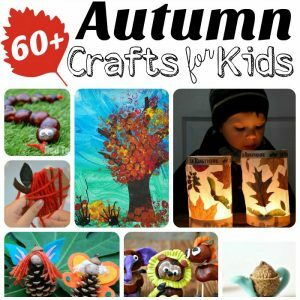 But if you need more Kids Crafts for Autumn we have a GREAT list for you to check out! 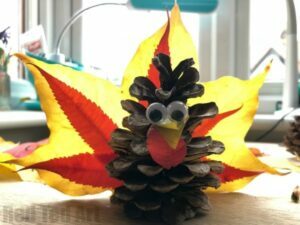 Many of the leaf crafts today, would also be brilliant for Thanksgiving Crafts – if you are after more thanksgiving ideas, we also have these 20+ Turkey Crafts for Kids 🙂 or take a look at our “how to preserve leaves” methodology post too! 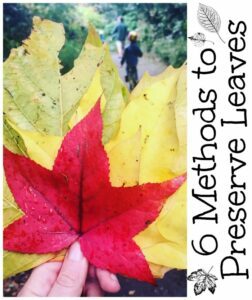 Now the thing to remember about leaves, is that they are not permanent – yes, you can preserve them by pressing them, waxing them, giving them glycerin baths, but the wonderful bright bright yellows and reds will always “just” be temporary. And even with preservation will fade or change to dark yellows/ oranges/ browns and deep deep reds. But that is ok, you just have to know to enjoy them in different ways and also for a shorter amount of time! 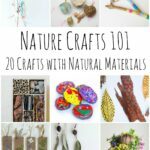 I have picked out a selection of our favourite leaf crafts – you may be familiar with some of them already (as I have shared them many times before..), but I wanted to share them again – JUST IN CASE you haven’t seen them or need reminding about their existence! 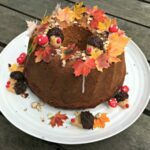 Autumn Leaf Bowls – use a kiln (like these in the photo), use air drying clay or use salt dough for a really thirfty craft! GORGEOUS Leaf and Pine Cone Turkeys. Don’t those leaves look like they are on fire? So vibrant and gorgeous! 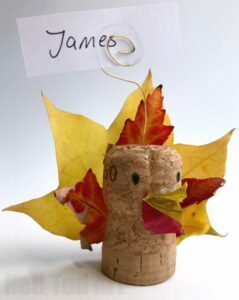 Similarly we have a wonderful Place Name Card Leaf Cork Turkey for Thanksgiving. 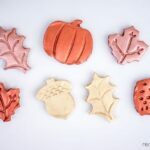 Adorable and so easy to make. Wonderful Leaf Critters. 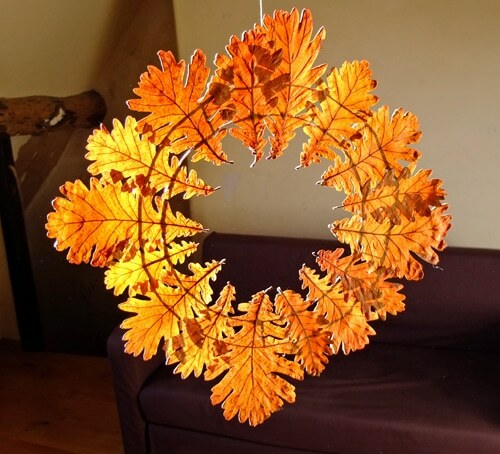 Turn your leaves into an arty canvas! 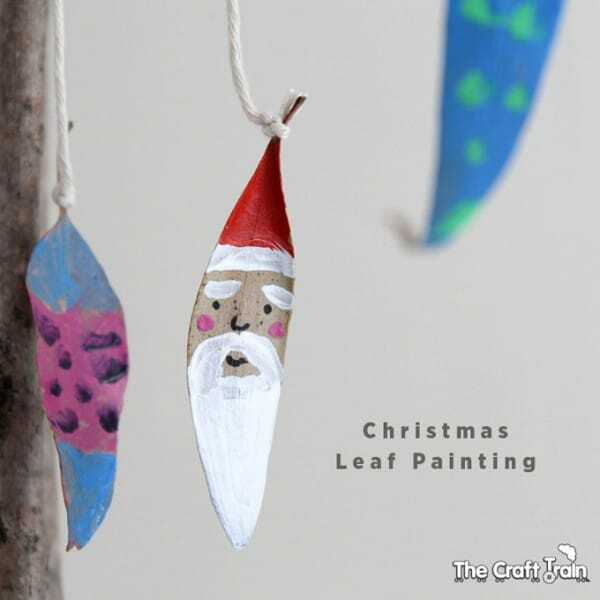 Love how the shape of this leaf inspired this gorgeous – Leaf Painting – Santa Ornament activity. 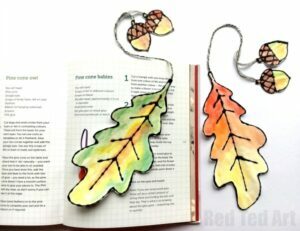 I love it when the shape dictates what you end up making (and a nice eucalyptus craft for our Aussie readers!). 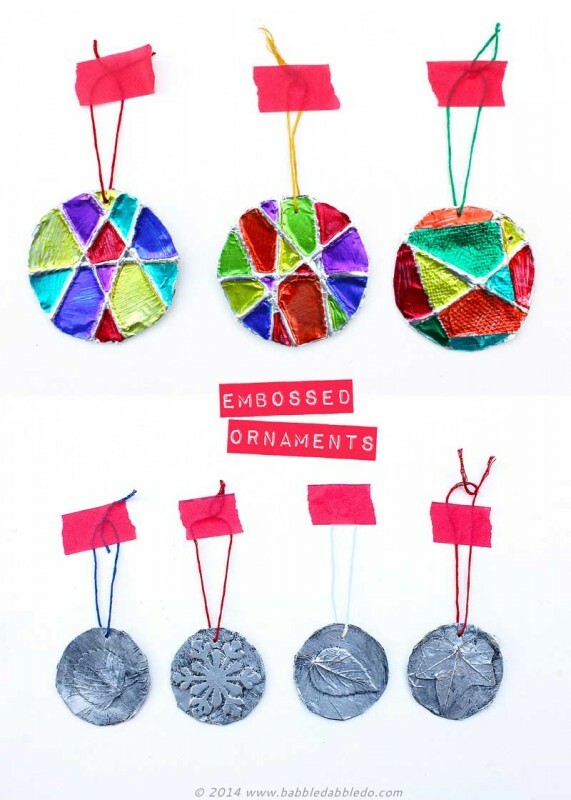 Similarly you can make these Leaf Embossed Ornaments – a great way to preserve those patterns and shapes! 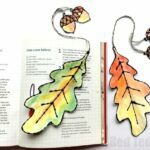 Super popular at the moment, is Leaf Doodle Art – all you need is leaves and a pen.. and off you go. I have shared it before and I will share it again. 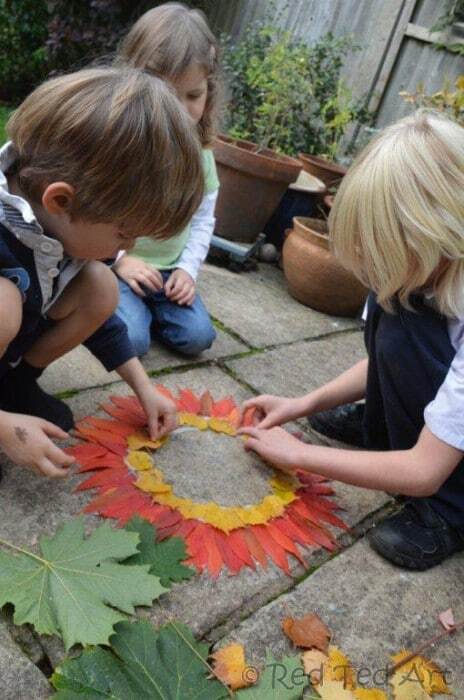 Andy Goldsworthy Projects are perfect for this time of year! 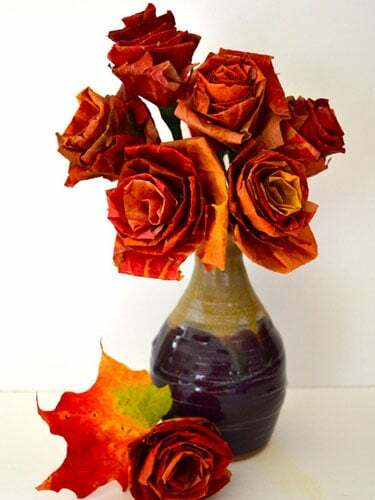 We have made Duct Tape Roses before – how about these stunning Leaf Roses?! Remember they will brown with time, so choose your colours carefully! 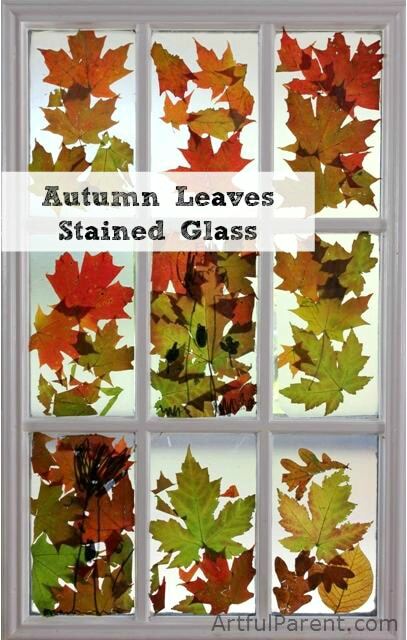 Autumn Leaf Stained Glass – we did something similar at school one year (it was actually a prank.. but one that was well received 🙂 ) We stuck a whole load of yellow leaves to the art room’s window using a flour and water “paste”. They stayed on for a good 2-3 weeks and then gradually blew away. The window was easily cleaned with soapy water (phew). 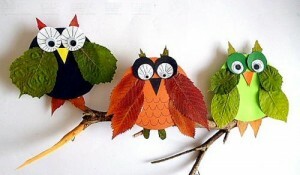 Remember leaves make great feathers! These Owls are beautiful. Remember to press your leaves first to avoid curling! 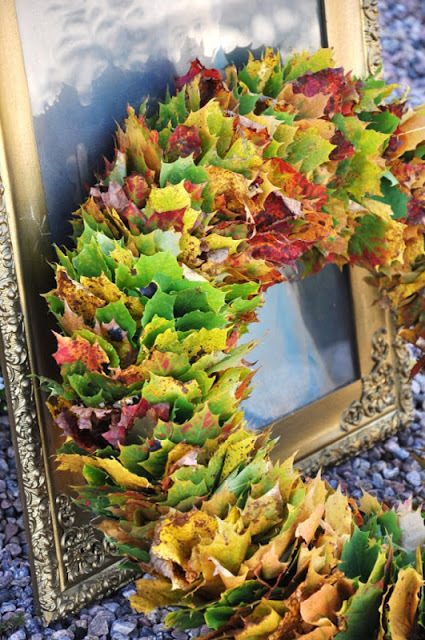 Another beautiful Leaf Wreath Version! Fun with a hole punch. 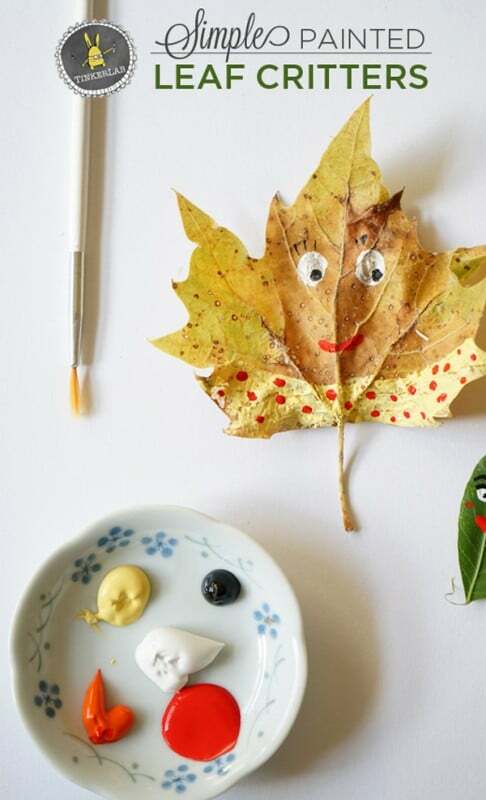 How adorable are these punched leaves – use your holes and your punches in art projects! 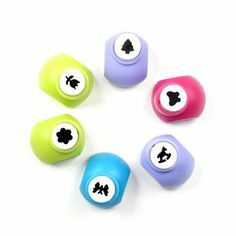 I found a great set of punches for you here… be sure to browse for different sizes! 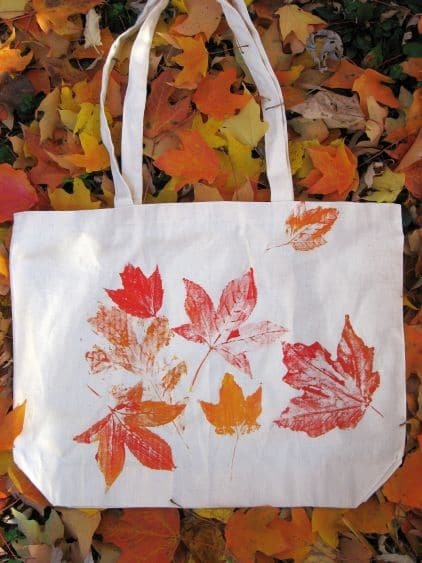 Leaf Print Totes – these would make lovely Christmas Gifts too! 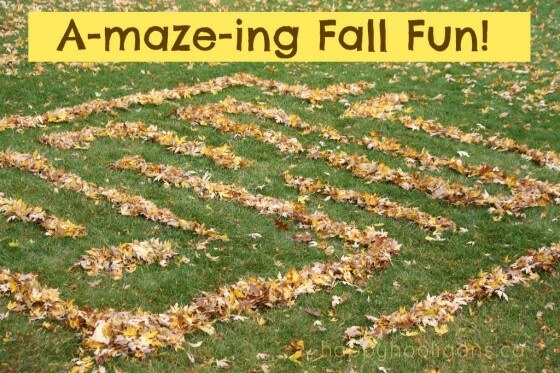 Leaf Maze – a super cute and fun idea!! 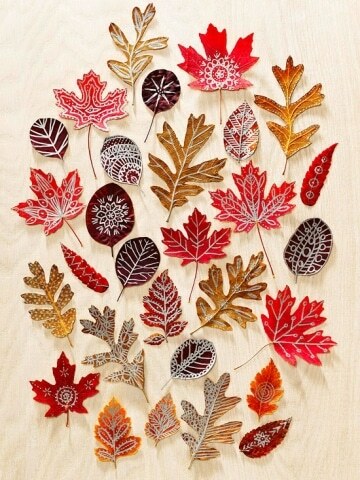 I hope you enjoyed these leaf crafts! Would love to see what crafty goodness you come up with. Share your photos on my Facebook Wall, or on Instagram using the #KidsCrafts101 hashtag. 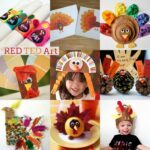 We have our #kidscrafts101 WINNERS!! Selected by our lovely judge @tinkerlab (she has an amazing IG account which *has to be* followed!! ??? 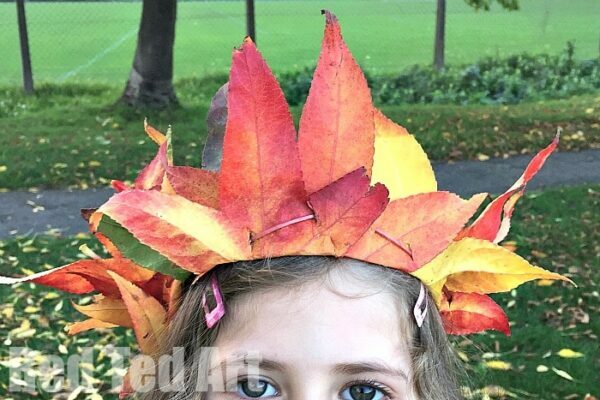 REPOST I'm a terrible judge because I see winners in everyone's work, and have to admit that ALL of the submissions to this week's #kidscrafts101 (make something with leaves) melted my heart. I limited myself to five, and I hope you'll find these images as inspiring as I have: @housingaforest made handprint trees with circles punched from leaves, @pgpbmeghan collected leaves and did process-based art inspired by the artist Rousseau, @cintaandco collected leaves for drawing and naming like scientific specimens, @flashbugsstudio made pretty suncatchers with embroidery hoops, @kayjaysews added colorful stickers to dark leaves and that contrast is striking! 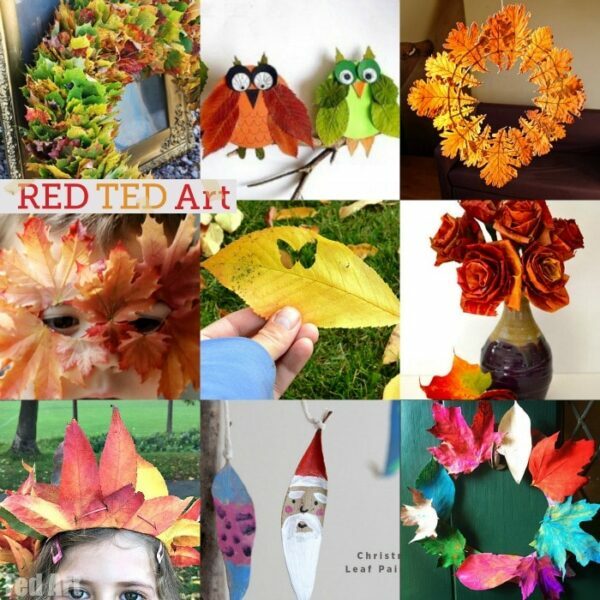 Follow @redtedart @anadziengel and @incredibusy for clues about next week's craft challenge! Thanks for inviting me to judge this week. 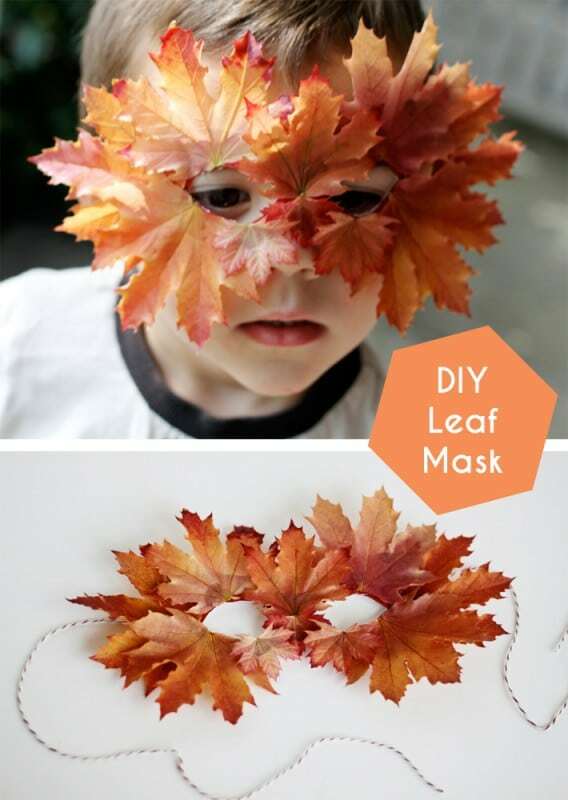 Have fun with our leaf craft inspiration and DIYs! Happy making! Wow! So many beautiful ideas in this round-up!!! 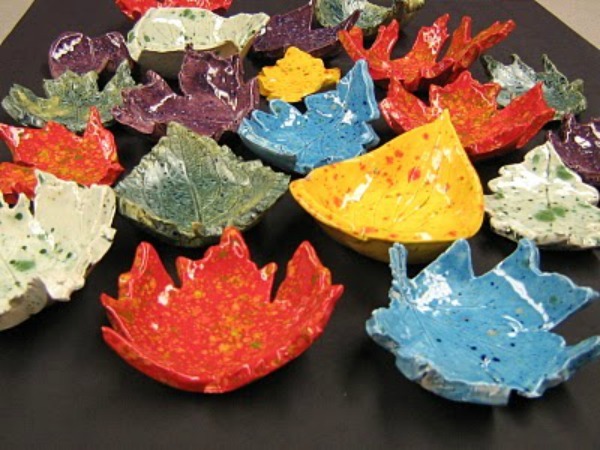 My son gets to make leaf bowls like those in his second grade class this year, and I am excited for him! The owls are adorable. 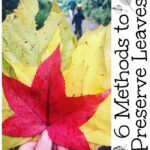 Which leaf do we need pick? fallen leaf or leaf that still attaches to the tree? I try to use fallen leaves!